The stainless carafe is made of double wall stainless steel and very impressed in locking temperature, to provide you hot coffee, water, Juice, tea, and cold drinks for all day long, withstand the demands of everyday use, perfect for home & office & outdoor and restaurant use. Made from durable 18/8 stainless steel, the double wall stainless steel vacuum insulation is efficient to lock temperature and keep beverages' temperature for 24 hours. It can keep your coffee, water, milk, juice and tea warm all day. Insulated carafe keep you drinks cold for longer time via adding a few ice cubes. 1.5L capacity meet every day use. Open the leaf-proof top by a push button. It is easy for one-handed pouring drinks and ideal for home & office & outdoor and restaurant use. Lightweight and portable, it is convenient for both indoor and outdoor use. Large mouth opening makes it easy to filling, pouring and cleaning. Q: Are these dishwasher safe? A: It is designed for both home and commercial use. Q: Is the unit truly bpa free? 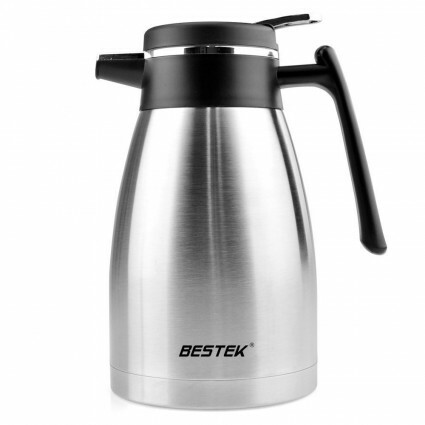 A: BESTEK 3.5 Bar Steam Espresso and Cappuccino Maker Coffee Machine is truly the BPA free, as it also comes with ETL/FDA Approved, please feel relieved about usage. Q: Whats the difference between double wall vacuum insulated & just insulated? Q: How big is the opening under the lid.I want to be able to get my hand inside for cleaning. A: The opening is at the most 2 inches. You will not get your hand in it. I would suggest a bottle brush. Q: Is there plastic on the inside of the carafe or is it just the lid? I plan to use for hot coffee and don't want it to touch plastic if possible. A: No it does not have plastic inside. Q: How large is the opening? Would it fit a pour over coffee dripper? A: The opening on the top is about 2 1/2". We put the drip basket from a Bunn drip coffee pot on top and it works great.